Writing your own personalized wedding vows can be a daunting task, but it's not quite as hard as it looks. 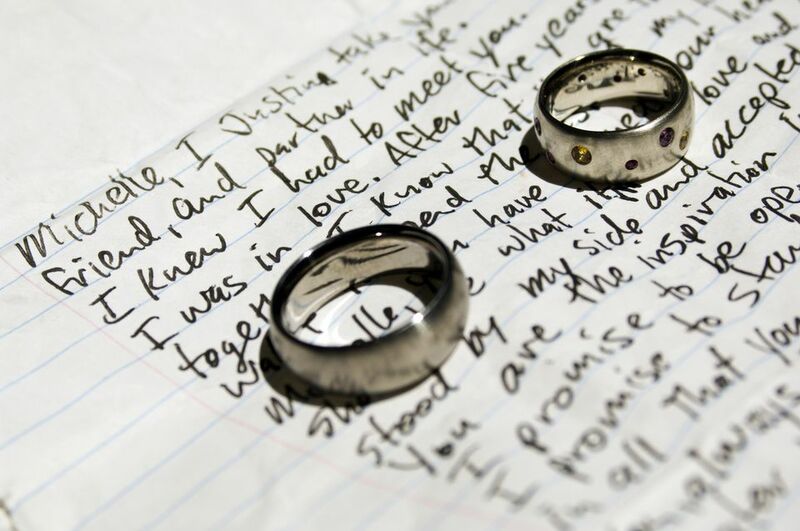 Here are six easy steps that you can follow to write your own wedding vows. Make sure that everyone is on the same page. Talk to your future spouse and your officiant and make sure everyone is okay with personalized wedding vows. Some religions require that you use the traditional wording, while others will allow you to write your own, as long as you include certain phrases. You'll also want to make sure that your sweetheart also wants to do it. While you're at it, decide together whether you want to write one set of wedding vows that you will both say, or whether you want to write them individually. Answer some simple questions. It's homework time. Sit down in a quiet space with paper and pen and answer these questions. Even if you don't think the answer will end up in your wedding vows, take the time to write it down anyway. It may help you in the long run. If you encounter writer's block, first try taking a short break. If you're still having trouble, try speaking the answers into a tape recorder, letting the thoughts flow freely. Consult the experts. Take some time to read through a variety of wedding vows, as well as passages of poetry, love stories, and famous writing about love. Print out your favorites, and highlight passages that especially speak to you. Put it all together. Go back to the words you wrote before, and highlight passages that you might want to include in your wedding vows. Now is the time to pare things down and select the very best of all the material you have to work with. Try taking a sentence or two from literature, add a sentence or two from the answers to the above questions, and finish with a vow—a sentence that begins "I promise" or "I vow". For example, you might say: "Mary, as the poet Rilke said, 'This is the miracle that happens every time to those who really love. The more they give, the more they possess.' You are the most generous, loving, unselfish person I know. I fell in love with you the moment I first saw you with your daughter, treating her with such respect and giving her all of you. I feel so fortunate that you have chosen to share your love with me, and that I get to grow old next to you. Mary, today I choose you for my wife. I promise to love you, honor you, care for you, and be faithful to you, from this day forward and for the rest of our lives." Practice, Practice, Practice. First, try reading what you've written out loud to a trusted friend or family member. Ideally, this person will be someone who is a good writer, and someone who knows your relationship. They may have good suggestions for you, or the simple act of reading it out loud might help you identify places where you can improve. Once you've worked out a final version, practice reading it on your own to make sure you are comfortable with it. If you can, try to memorize it. But whether or not you memorize well, make sure that you write down your wedding vows on a note card (and give an extra copy to the best man or maid of honor!) so that nerves won't spoil all of your hard work.